John was no stranger to the heartbreak of loss. The Rwandan genocide claimed the lives of his entire family, his first and second wives died, and he was left alone to care for his infant son, Daniel. Doing what he thought was best for his child, John gave Daniel to an orphanage. For three years, John walked for miles to see Daniel. He visited as often as possible, always leaving brokenhearted. His son was being raised by strangers and used as free labor to plant and harvest pineapples. “Even though I’m a big man, I would cry and my son would cry when I left,” he recalls. Still, John thought it was best for Daniel to stay in a place that wouldn’t struggle to feed him and could give him a comfortable place to sleep and shoes for his little feet. John learned about parenting training and ongoing support that was available to him through Saddleback’s Orphan Care Initiative and the local Rwandan church. During a training class at the orphanage, John listened to the reasons why a child needs a family while he lovingly cradled Daniel and watched him fall asleep in his arms. At that moment, John knew he had everything it took to take care of Daniel, and he made the decision to take his son home. The orphanage director, hesitant to let his child labor go, suggested that John go home and prepare first. John replied, “Get what ready?” He knew there was no preparation required, and that an open heart for his child was the only thing that was truly necessary. Today, one more child has a loving home because one more father opened his heart to receive an estranged child. Through Saddleback’s Orphan Care Initiative and the local Rwandan church, one more family has been reunited. To learn how you can sponsor a family in Rwanda to take in a child from the orphanage, visit www.saddleback.com/sponsorship. 10 year old Joshua’s little hands are rough and deeply scratched. These are not the typical marks of childhood play; Joshua’s scars are the result of hours spent everyday under the hot sun digging holes in the dry Rwandan soil at the orphanage where he grew up. His physical injuries only mirror in part the emotional damage he still carries with him. A sprawling campus atop a mountainside covered in pineapples, his former orphanage looks for all appearances to be an idyllic place for an orphaned child to grow up. It prides itself on being a self-sustaining orphanage. By having the children farm pineapples on the hillside, the orphanage owners claim they are able to dry and export the extra fruit while the children learn the value of hard work. The reality is that this orphanage has been the setting for an untold number of tragedies. Joshua recently left the orphanage, finally adopted into a home and a Rwandan family all his own. Yet every morning he still wakes up and asks his new mama and papa if it’s time to work in the field. For Joshua, unending labor is all he has ever known. When his new mother served him pineapple, he looked at her quizzically. “What is this?” he asked. His mother realized with horror that Joshua had never tasted pineapple – the fruit he had been forced to farm for the entirety of his childhood. This month, that same orphanage on the hillside saw the sprouting of new, miraculous seeds of hope as twenty children walked off the grounds to join permanent families. After hearing about the vision of orphan care from the PEACE Plan, a group of local Seventh Day Adventist churches from the surrounding community decided that enough was enough. They spoke to their church members, asking them if God was calling them to adopt. Twenty families stepped up to answer the call and rescued a child from the isolation of the orphanage this month. Thanks to them, and the support of Orphan Sponsorship donors, twenty children are no longer nameless workers for the would-be labor camp. Twenty children get to feel the embrace of a mother for the first time. Twenty children have regained a childhood. This month, join us in praying that the remaining children in the orphanage would know the love of a family through adoption. Pray that the local churches all across Rwanda would continue to lead the way in caring for orphans in an unprecedented way. Also, pray for the families that have made the decision to take a new child into their home – that God would bless the transition as they work to heal the past hurts of their new sons and daughters. Click here to learn more about the Orphan Sponsorship program, or to become a Sponsor! This month marks 20 years since the genocide in Rwanda that devastated the country. All over Rwanda, local churches are remembering those lost, while also celebrating how far God has brought the country since that time. Pastor Leonidas is keenly aware of the change that transformed the country, as leader of a church in the Karongi District of the Western Province, an area hardest hit by the genocide. His church is a source of life and hope for his community, and many families in his congregation have experienced the transforming impact of PEACE Plan programs, including Orphan Sponsorship. One of his church members, Elena, is a prime example of the power of the PEACE Plan coming together with the local church and the generosity of sponsorship donors to create change. Elena is a single mother of eight children. Three of the children she took into her home when her neighbor developed AIDS and became too sick to care for them. Elena’s life was in shambles until she attended Pastor Leonidas’ church, which was going through the Purpose Driven Life study. Elena found hope and learned that God had a purpose for her life. Through the PEACE Plan, she learned how to care for her community. She joined a savings group and developed the heart to take in her neighbor’s children, who would have ended up in an orphanage without her care. Her new life in Christ, her local church, and the support of the Orphan Sponsorship Program gave her the confidence and resources to take additional children into her home. Through the money management skills she learned in her savings group, Elena was able to use her resources well, and she has now started a thriving new business which allows her to provide more for her children. To begin sponsoring a family in Rwanda to take in a child from the orphanage, click here. Looking to get connected to Orphan Care at Saddleback Church? 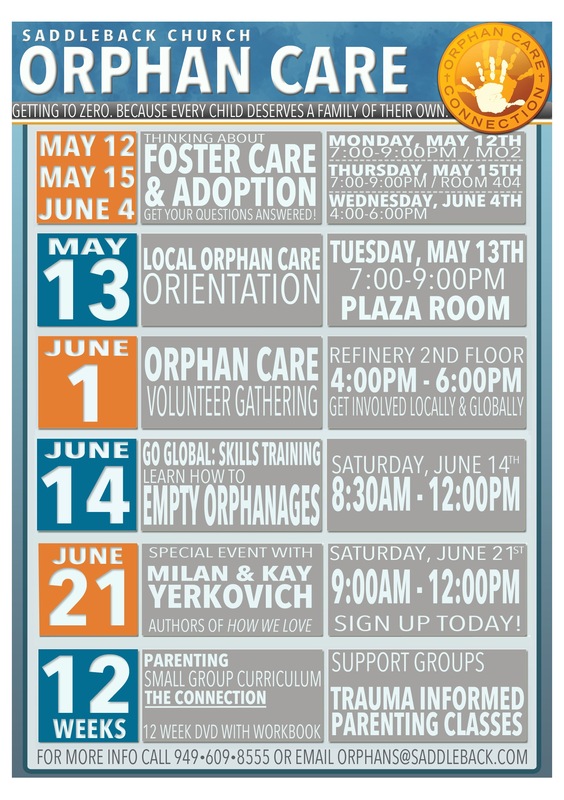 Looking to get connected to Orphan Care at Saddleback Church? May and June are action-packed with opportunities to learn more and serve! Have you considered adopting or fostering, but aren’t sure how to get started? This is the place for you! Families from our church who have adopted and fostered share helpful overviews and answer your questions in a no-pressure environment. Healthy attachment is the key to great families, and great adoptive and foster parenting. Using attachment theory, experts Milan and Kay Yerkovich have created the tools to take your relationships to the next level. Come learn your attachment style, how to grow your marriage, and take your parenting to the next level at this unique event. Our monthly orphan care volunteer gathering is a great opportunity to hear all that is going on locally and globally with orphan care, and get plugged in to serving opportunities! Connect with others in our ministry with a heart to make a difference in the global orphan care crisis. You can make a global impact! In this training, you will learn how to empty orphanages and help orphaned children find their forever families. If you are considering going on a PEACE trip, or just want to know more, join us for skills training! If you have a heart to serve orphaned children here in our own community, come to the local orphan care orientation to hear about the different opportunities, and how you can make a difference in the life of a foster child or adoptive family! Email lynny@saddleback.com for more information. Questions? Email orphans@saddleback.com or call 949-609-8555. The Orphan Care Iniative is coming alongside local churches as they partner with the Rwandan government in the effort to empty all the orphanages in Rwanda and place those children into loving, lasting, legal famlies. Part of this effort is our Rwanda Orphan Sponsorship program, which provides Rwandan families with the financial support needed to be able to take an additional child into their home, allowing the child to become a son or daughter, and not an orphan any longer. OUR GOAL IS TO ASSIST THE RWANDAN CHURCH AS THEY GET TO ZERO. ZERO CHILDREN LIVING IN RWANDAN ORPHANAGES. WE ARE DOING THIS BY MOBILIZING THE LOCAL CHURCHES IN RWANDA THROUGH THE PEACE PLAN TO CARE FOR ORPHANS IN THEIR COMMUNITIES. VOLUNTEERS FROM LOCAL CHURCHES ARE TRAINED IN HOW TO COME ALONGSIDE FAMILES THAT ARE TAKING IN CHILDREN FROM THE ORPHANAGE. FAMILIES WHO NEED FINANCIAL ASSISTANCE TO TAKE IN A CHILD FROM THE ORPHANAGE ARE ABLE TO RECEIVE SUPPORT FROM THE RWANDA ORPHAN SPONSORSHIP PROGRAM. · Families provide school fees, medical insurance and basic necessities for the child they welcomed into their home. · Families join a savings group to learn how to make their income sustainable. · Families multiply dividends from their sponsorship funds. THERE IS STILL MORE TO BE DONE: The Rwandan government has asked the PEACE Plan to take a greater role in deinstitutionalization, working in every area where government social workers are focused. If you would like to sponsor a family in Rwanda to take in a child from the orphanage, please click here. To visit Rwanda and make a difference on an Orphan Care PEACE trip, please email orphans@saddleback.com.